The government has sanctioned 19.82 lakh posts for teachers to various states and union territories under the Sarva Shiksha Abhiyan programme. Under the 12th Five Year Plan, the Central Government has sanctioned Rupees 6300crore to strengthen teacher education. Despite the massive efforts towards digitisation that are being undertaken, the education system in the country is being stymied due to the lack of properly trained teachers. The Central government’sinitiative to recruit 19.82 new teachers will help in bridging the gap toa significant extent. ICTs have a major role to play in education. The ICT revolution has providedus with a means for taking teaching and learning out of the confines of theexisting schools and colleges, but students still need access to quality teachersin order to make progress in their learning. The teaching cannot be completelydissociated form the teachers; it must not become insensitive to human relationshipsthat exists between the teacher and the taught. We no longer have achoice in either area. It is no longer an “if ” but “how” to deploy the technologiesoptimally and recruit more teachers to meet the demand-supply gap. These are just some of the fundamental issues in education that digitalLEARNING has been raising over the years. It is time for us to raise it once again,not only in the magazine, but also in our popular summit on educational issues,the World Education Summit (WES), which is scheduled for 23-24 April,2013, at Le Meridian Hotel, New Delhi. Since its inception, three years ago, theWES has been taking a holistic look at promoting ICT in education. This is thethird edition of the WES. By the time the issue reaches your hands, the magazinewill already be out. In fact, the magazine is being launched at the WES. Some of the main challenges that the World Education Summit seeks to addressare access, inclusion and quality. This issue of digitalLEARNING is designed toserve as a precursor to the WES. The magazine seeks to set the agenda thatwill be further pursued at the WES with hope that new ideas for improving thestate of our education will emerge. With this objective in mind, while framingthis issue of digitalLEARNING, we have interacted with a host of stakeholdersfrom the education space. We have the interviews of the education minister of Rajasthan, and also of countries like Maldives and Nepal. There are interactions with senior officials from MHRD. Then there are the enlightening perspectives from industry and the academic community. The range of views that have been expressed are evocative of the passion that education arouses in the modern world. We hope that you will enjoy this issue. 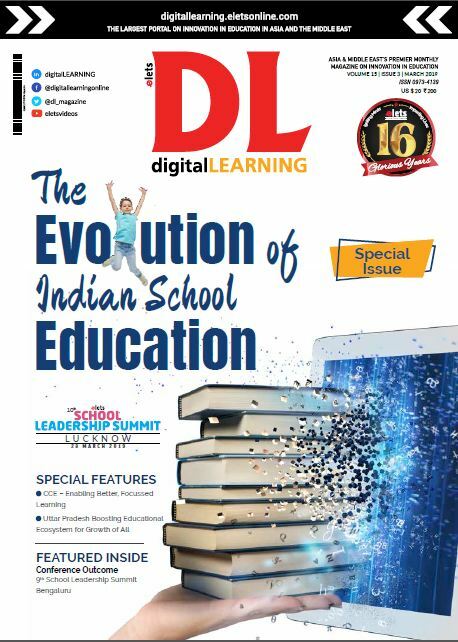 Do write back to us with your feedback on this issue of digitalLEARNING and on the World Education Summit.